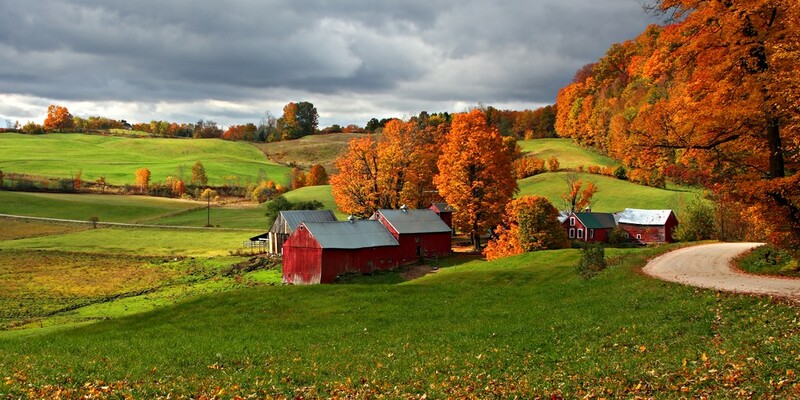 With its idyllic setting, charming New England villages, and year-round outdoor activities, Vermont is the ideal spot for a romantic getaway. Here are our picks for the state’s most romantic resorts and hotels—perfect for honeymoons, anniversaries, and other romantic occasions. Nestled in the heart of Stowe Village, as in located directly on Main Street, the Green Mountain Inn has been entertaining guests and newlyweds for nearly 200 years. The elegant resort sits within walking distance of a variety of shops, galleries, and eateries and is just a short drive to the slopes of Mt. Mansfield or a factory tour at Ben & Jerry’s Ice Cream in Waterbury. The recently renovated rooms, which range from a cozy classic to a three-bedroom town home, offer everything you might need while away, including Vermont handcrafted furnishings, 300-count Egyptian cotton bedding, and fireside Jacuzzis (in certain rooms). The Green Mountain Inn also provides complimentary afternoon tea and cookies, a year-round outdoor heated pool, an in-ground outdoor Jacuzzi, and a massage center. Two acclaimed on-site restaurants serve everything from fine dining to casual fare and cocktails to boot. Rooms range from $139 per night to $279 per night, depending on the type of accommodation and the season. Situated in the center of the quintessential New England town of Woodstock Village, the Woodstock Inn and Resort is steps from boutique shops, local cafes, country stores, and art galleries, as well as just a quick ride to the Marsh-Billings-Rockefeller National Park (admission to the park is included for guests of the hotel) and the Quechee Gorge. With plenty of nearby attractions, the Woodstock Inn and Resort offers complimentary cruiser bike rentals for guests who want to explore the area on two wheels. During the colder months, the Woodstock Inn and Resort offers free lift tickets (on weekdays, non-peak periods) to ski or snowboard at the nearby Suicide Six Ski Area. For those who would rather stay close to home, the inn features a 10,000-foot LEED-certified spa, an 18-hole golf course (named one of the 100 golf resorts by Golf Magazine), and four distinct dining options, including the AAA Four Diamond Award-winning restaurant, The Red Rooster, and complimentary afternoon tea in the Conservatory. Rooms come equipped with wood-burning fireplaces, handcrafted bed frames, and all the creature comforts of home. The hotel offers a slew of seasonal packages, which include extras such as breakfast and welcome wine. Room-only rates vary depending on the season. The Equinox Golf Resort & Spa in the historic village of Manchester has welcomed guests from all over the world, including four U.S. presidents, since 1769. The property has expanded and undergone a few changes, including a major restoration, since its humble beginnings as the Marsh Tavern. It now includes five unique buildings, which house 195 rooms and suites, each equipped with modern-day amenities and views of Equinox Mountain, the resort’s seasonal gardens, or the town. Manchester once served as an exclusive playground for the country’s upper class, which is reflected in its elegant architecture, well-manicured landscape, and designer outlet shops. Guests of the inn can explore the nearby sights, such as the Southern Vermont Arts Center, or opt to take hands-on classes with the Orvis Fly-Fishing School, the Land Rover Experience Driving School, or the Orvis Shooting School. The Equinox Golf Resort & Spa also features a par-71 golf course, a tennis club, a 75-foot year-round indoor pool, a fitness club, and a 13,000-foot spa. Rooms range from $230 per night to $729 per night for off-season stays. Prices may be lower or higher depending on the season. As a member of the “Small Luxury Hotels of the World” and listed on the National Register of Historic Places, Castle Hill Resort and Spa brings a European-style escape to the Green Mountains of Ludlow. Castle Hill Resort and Spa is within minutes of the ski trails at Okemo Mountain, Buttermilk Falls, and 15 covered bridges peppered throughout the Okemo Valley region. The English-Cotswold-style mansion was constructed at the turn of the century and still maintains some of its original features, including the gardens and the building’s footprint. Guests can choose from 10 castle rooms, each with a unique layout and decorated with timeless period pieces. After a day exploring the surrounding area, guests can unwind at the on-site Aveda Concept Spa, which includes an outdoor heated pool and a hot tub. Dinner is a seasonally inspired prix fixe, four-course menu, served in the gourmet restaurant’s candlelit wood-paneled dining room. Room rates start at $254 per night for off-season stays. Prices may be lower or higher depending on the season. Located at the base of the Stowe Mountain Resort, just steps from the gondola that connects Spruce Peak to Mt. Mansfield, the Stowe Mountain Lodge is like glamping indoors. The six-story hotel was built in 2008 in the new “Vermont-Alpine” style, taking architectural inspiration from turn-of-the-century summer camps while adding modern-day luxuries. The result is a 300-room lodge that reflects the beauty of the surrounding area. Each room includes oversized windows and an outdoor balcony with views of Mt. Mansfield or Spruce Peak; most also come with stone-framed fireplaces and kitchenettes. Within minutes of the resort, guests can ski, hike, bike, fish, marvel at fall foliage, or shop in downtown Stowe. The Stowe Mountain Lodge also features a world-class spa, a private 18-hole championship mountain golf course, a heated outdoor pool with indoor access, on-site designer shopping, and artisan-inspired casual and fine-dining restaurants. Recognized as one of the best hotels in 2014 by Conde Nast Traveler, 506 On the River is the new hip place to stay in Woodstock Village. The family-run hotel sits on six acres of land overlooking the Ottauquechee River and is just a stone’s throw from shopping in the village, skiing at Suicide Six, and learning about livestock at Billings Farm & Museum. The eclectic interior of the hotel combines quirky antiques with elegant furnishings. Each room features a river view and comes complete with a balcony and rocking chair to enjoy the scenery. Guests enjoy a complimentary country breakfast (with maple syrup from the family farm) and coffee and tea throughout the day. At night, the vintage bar whips up signature cocktails, while 506 Bistro serves a seasonal menu highlighting regional ingredients. The hotel also offers a library, complimentary Wi-Fi, an entertainment lounge, and a toddler playroom. Rooms range from $199 per night to $319 per night for off-season stays. Prices may be lower or higher depending on the season. The Reluctant Panther Inn & Restaurant in picture-perfect Manchester Village is recognized as one of the Small Luxury Hotels of the World. Guests of the Reluctant Panther Inn & Restaurant will never want for things to do, as the hotel provides easy access to upscale outlet shopping, golf, tennis, horseback riding, biking, skiing, skating, and more. The inn’s 20 rooms and suites feature fireplaces, marble baths, museum-quality artwork, antique furnishings, and 300-thread-count linens, as well as complimentary cooked-to-order breakfast for two and free Wi-Fi. Dinner is typically served in the hotel’s #1 Zagat-rated restaurant, where contemporary American cuisine, with a focus on locally sourced products, meets a Wine Spectator-award-winning wine list. During the warmer months, guests can dine on the patio (open seasonally) and enjoy a raw bar alongside views of the gardens and Mt. Equinox. Rooms range from $299 per night to $549 per night. Prices may be lower or higher depending on the season. Located in downtown Burlington, Hotel Vermont captures the heartbeat of this unique city with its rustic and modern details, hip and gourmet dining and drinking options, and feel-good amenities. Each of Hotel Vermont’s 125 guest rooms provide ample space for relaxation and come with complimentary high-speed Internet; access to a communal pantry with local coffee, tea, and filtered water; and a Bedtime Menu that features aromatherapy, flannel pajamas, and Vermont teddy bears. An on-site full-service yoga studio and an in-house massage room further provide guests with the opportunity to unwind. As for dining, two exciting restaurants provide plenty of reasons to never leave the hotel: Juniper, a cocktail bar and restaurant that features an on-site beer concierge (yes, he is here to answer all hops and malt questions you could have), and Hen of the Wood, a well-loved and highly respected Waterbury restaurant that has opened its only other location inside the hotel. If guests want to explore the surrounding city during the winter months, the hotel provides complimentary Vermont-made TSL snowshoes. Rooms range from $209 per night to $529 per night for off-season stays. Prices may be lower or higher depending on the season. Related: Top 10 Beaches in the U.S. Located in the town of Grafton, which is on the National Register of Historic Places, the Grafton Inn opened its doors in 1801 and is one of the oldest operating inns in America. The town of Grafton has gone to great lengths to preserve and restore its pre-Civil War ambiance, and the result is a one-of-a-kind escape. Just a few minutes from the Grafton Inn, guests can learn how to make their own cheese, visit a blacksmith, and explore art galleries, museums, and shops. The Grafton Inn offers 45 rooms, suites, and guest houses. Each stay includes a hearty breakfast. The seasonal recreation center provides use of mountain bikes for guests wishing to explore the area, while on-site yoga classes and massages make it easy to stay close by. Hungry guests can enjoy casual fare as well as an afternoon Grafton cheese and cider social at The Phelps Barn Pub or farm-to-table fare in a candlelit setting at the Old Tavern Restaurant. Rooms start at $119 per night for off-season stays. Prices may fluctuate depending on the season. Just 11 miles from Killington and Rutland, in central Vermont, The Mountain Top Inn & Resort is a dream romantic getaway for outdoor enthusiasts. The resort sits on 350 scenic acres of land that include views of a recreational mountain lake and the Green Mountain National Forest. During the summer, guests can learn horseback riding, play tennis, try yoga, or lounge around the heated outdoor swimming pool or on the private beach (canoes and kayaks are available for use). The winter brings a new set of activities, such as horse-drawn sleigh rides, snowshoeing, snow tubing, and snowmobiling. There is also massage therapy to help guests relax after a full day of play. Rooms offer creature comforts and some come outfitted with little luxuries like kitchenettes, fireplaces, and whirlpool tubs. The Highlands Dining Room serves innovative cuisine in a traditional mountain-lodge setting, perfect for a romantic candlelit dinner for two, while the Mountain Top Tavern provides a more casual menu and cocktails. Rooms range from $170 per night to $315 per night, depending on the type of accommodation and the season.